The Saints Hall of Fame Museum is open by appointment only between 9-3 weekdays at a cost of $10 for adults, $5 for children 12-and-under, $5 for seniors 60-and-over, $5 for military and $5 for any group of 10 or more, regardless of age. To schedule a tour of the Saints Hall of Fame Museum, email [email protected] or call (504) 471-2192. Founded in 1987, the Saints Hall of Fame Museum opened its doors on July 16, 1988 in the historic Rivertown district of Kenner. The museum relocated to the historic Mercedes-Benz Superdome in 2007, where it has resided since. The newly renovated Saints Hall of Fame, located at the Mercedes-Benz Superdome Gate B Plaza Level, can accommodate a wide range of events including: corporate meetings, reunions, theater style presentations, birthday parties, and private receptions – just to name a few. Let your guests take a walk back in time and explore the beginnings of the New Orleans Saints Franchise and recall many of the memories that have made the Saints a staple of New Orleans. 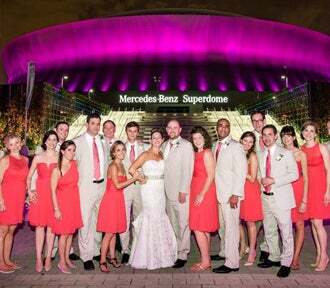 For more information about booking a special private in the Saints Hall of Fame or to receive a customized proposal, please call the Sales Department at (504) 587-3663.